Pleuropneumonia-like Organisms (PPLO) Mycoplasmataceae provides information on the characteristics, nature, and reactions of pleuropneumonia-like organisms (PPLO) or mycoplasmataceae. 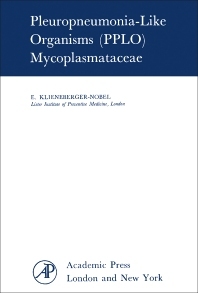 The book first offers information on bovine pleuropneumonia and agalactia of sheep and goats and the discovery of their etiological agents and discovery of organisms closely related to the organisms of pleuropneumonia bovis and agalactia of the mentioned animals. Topics include misinterpretations of disease conditions due to PPLO in experimental animals, contagious pleuropneumonia bovis, and organisms from dogs with distemper. The text then takes a look at the morphology, isolation, and growth characteristics of PPLO, as well as organisms from rats, mice, dogs, cattle, and humans and subculturing and maintenance of PPLO. The publication examines chicken coccobacilliform bodies and PPLO and similarities and differences between PPLO and L-forms of bacteria. The manuscript is a dependable source of information for readers interested in pleuropneumonia-like organisms.